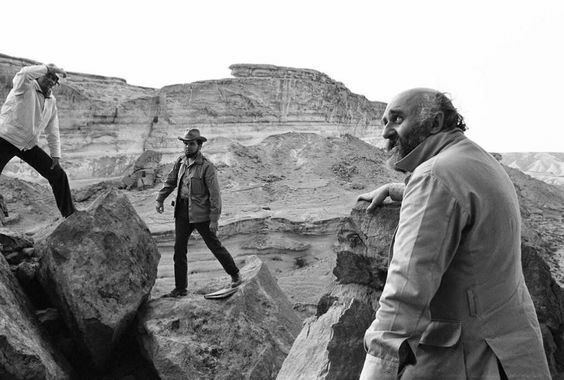 On a recce with Producer Gary Kurtz in Tunisia (with assistant director Tony Waye), the late British Production Designer John Barry goes through locations he previously visited and used for the dream-like fantasy The Little Prince, now being even more effectively utilized for the original STAR WARS filming set on the desert world of Tatooine, during March/April 1976. No one working on the film at that time will ever forget its spectacular and never seen anything like it set design and creation at London's Elstree and Shepperton Studios, with Barry getting deserved credit and an Academy Award, working well with Lucas and conceptual designer Ralph McQuarrie. Most of the film's allocated budget was going on effects and production design, and Barry made sure every penny available to him was put up on screen, working miracles in a short time and often against the filming clock demanded by FOX, and defining a visual design style for our heroes and villains that continues to this day.